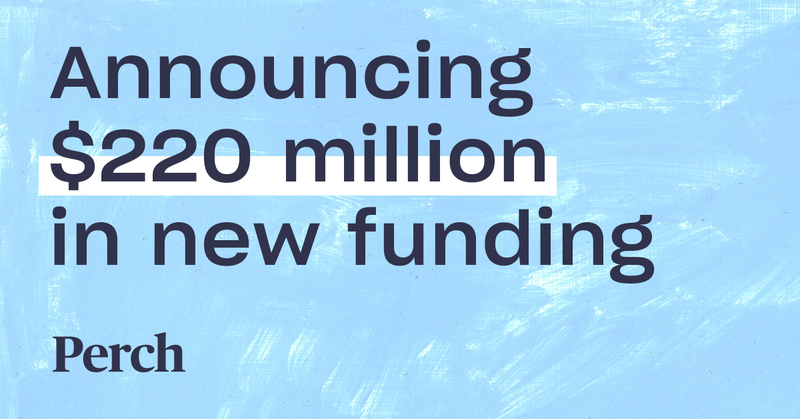 We’re excited to announce today that we have raised $220M in new funding to scale our services for homeowners looking to buy and sell a home. The funding is a combination of equity to fund operations and debt to fund home purchases. Our equity investment was led by FirstMark Capital, with Accomplice and Juxtapose also participating in the round. Our buy and sell solution eliminates the need for home buyers to worry about missing out on their dream home because they haven’t found a buyer for their old home. Last year there were over $1.5 trillion in home sales, with almost all of that listed and sold through a traditional home selling process that involves months of uncertainty and inconvenience. At Perch, we focus on serving the largest segment of home buyers, which we call “dual trackers”. “Dual trackers” are homeowners that are looking to sell their current home in order to purchase their next home. They represent ~60% of all home buyers. Currently, these homeowners face a dilemma: do they try to sell before buying or buy before selling? When homeowners sell their home first, they often end up in a short-term rental and putting their things in storage while they look for their next home. Alternatively, they can make an offer to purchase their next home that is contingent on the sale of their current home, which is a less attractive offer that risks being avoided altogether by sellers. Our Perch solution enables dual trackers to sell with certainty and buy with ease. We give customers an offer to purchase their home that is valid for 6 months, during which we’ll help them find their new home. Once they make an offer on their next home, we’ll enable them to close on both properties the same day. We offer this service for a 6% fee on the home the customer sells – the same price as the more cumbersome traditional home sale process. “We are solving one of the biggest problems in residential real estate - the inability of homeowners to line up the sale of their old home with the purchase of their new home. In the year ahead, Perch will continue to delight customers by bringing the entire home purchase experience, from discovery to closing, into the modern era. We’re thrilled that our investors share our vision for bringing a better home buying and selling experience to millions of homeowners,” said Court Cunningham, Perch Co-Founder and CEO. Perch soft launched in our pilot market of San Antonio in early 2018 and we’ve since expanded to Dallas-Fort Worth, with more markets on the horizon. We’ve become a prominent fixture in the San Antonio community, earning nearly 2% market share in December 2018. – Sean Roberts, CFO and Head of Real Estate: Previously a Principal at TPG Real Estate, where he focused on platform and portfolio investments in operationally-intensive real estate asset types. – Rahil Esmail, Head of Consumer Product: Formerly Director of Product at Harry’s and one of their earliest employees, he helped build the brand’s direct to consumer business, scaling to 3+ million customers. – Brad Bogovich, General Manager - Dallas-Fort Worth: Previously Operations Manager at David Weekley Homes where he ran multiple markets over his 17-year career there, including Dallas, Houston and Raleigh. – Aaron Emrich, Director of Market Expansion: Previously General Manager at Uber, where over a 5-year career he led rideshare expansion efforts in both the United States and Asia and launched and ran Uber Eats across the US South region. They join our experienced leadership team including co-founders Court Cunningham, CEO, former CEO of Yodle (acquired by Web.com) and Phil DeGisi, Head of Growth & Customer Experience, formerly of Quidsi (acquired by Amazon) and CommonBond. “Perch has assembled one of the top teams in all of consumer tech and has quickly established itself as a disruptor in residential real estate. We are huge believers in the team’s approach to serving dual track customers and look forward to their continued growth,” said Rick Heitzmann, Managing Director at FirstMark Capital.